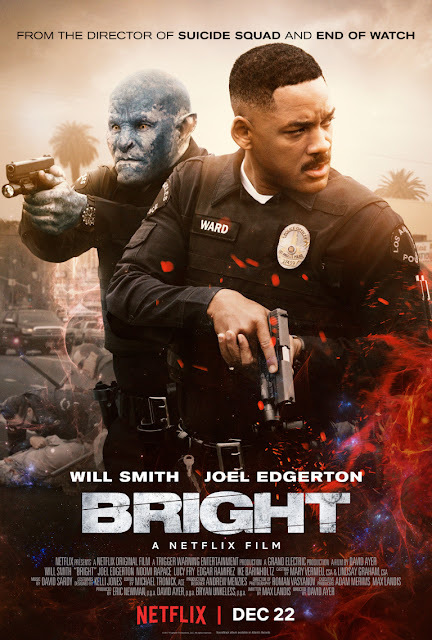 Chrichton's World: Review Bright (2017): Hate is unjustified because unlike David Ayer's Sucide Squad this was really entertaining! Review Bright (2017): Hate is unjustified because unlike David Ayer's Sucide Squad this was really entertaining! Bright is the type of action blockbuster film I very happily would want to view in the cinema and never feel any regret about. And yet it's not released in cinemas. It went straight to Netflix because they managed to outbid film studios like Warner Brothers. Whether this is a good development or not I don't want to go into now. But it's important to realize that Bright is a big and very ambitious project I would like to see more of. The film might not be bold, daring or challenging it does offer some food for thought in case you want more than action and thrills. However since there is a lot of action in it naturally Bright will be better enjoyed if you love action films. In essence Bright is a more serious buddy cop film set in a world where elves, orcs, fairies and magic are real. It's an interesting take and has real potential to be expanded on so I wouldn't be surprised if they will make a franchise out of it. I for one am already looking forward to the sequel since I can't wait to find out more about this world. But what really surprised me was how they combined the fantasy element with the gritty crime thriller ones. It made everything a whole lot more interesting and kept things quite fresh which it should be commended for. But of course it also helps to have Will Smith in this film where he is partnered up with an Orc named Nick played by Joel Edgerton. Will and Joel have good chemistry especially in the scenes where they are at odds with each other. But Noomi Rapace as angry and ruthless elf Leilah certainly makes an impression as well. It's these characters that make the world believable. The action is solid and here and there very exciting. Especially the evil Elves seem to be very skilled and deadly like ninja's. The Elves reminded me of the ones in Lord of the Rings. They look and act very similar in their demeanour. Actually a lot of the fantasy elements reminded me of LOTR. Like the part where it's prophesied this special magic wand will release The Dark One or whatever he was called. Some of the action looked like it was ripped straight from Harry Potter films where Harry is battling evil wizards. Only don't let this give you the impression it's childish. There is some blood and gore present. Not much but enough to convince you that these mythical creatures aren't messing about. Bright is entertaining from start to end. It moves along in a very fast pace with a few slow downs here and there but nothing to get frustrated about. But not once did I think that this was a bad film. In fact the world that is set up has a lot of potential. I liked how the social commentary was not the main focus but still made it's mark adequately enough. When a film gets too preachy it can be off putting. Bright avoids this and thus therefore is more effective. I don't understand how this film is getting so much hate from renowned critics. A lot of them praised Suicide Squad and yet rage on this like it's the worst film ever. Bright is superior to Suicide Squad in every way. So don't listen to them.